A: Sound like you have the infamous "artillery fungus." 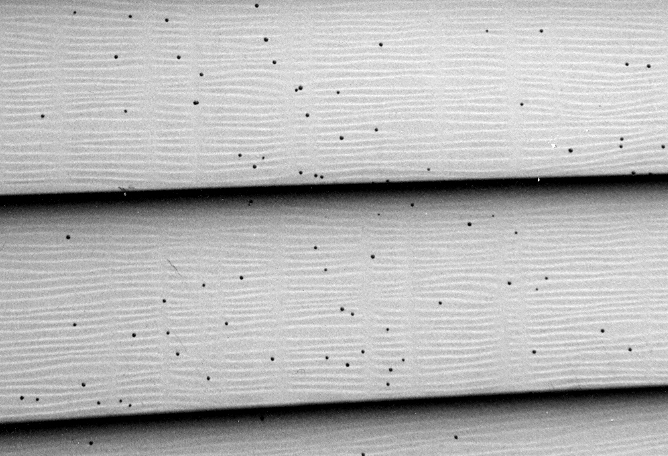 Click here (link) to see what the spores of the artillery fungus look like on house siding. A: Yes, this is common on the sides of automobiles when cars are parked near mulched areas that are infested with the artillery fungus. It is especially noticeable on white sports cars -- at least these are the owners that complain the most. In fact, we have had complaints where private companies have artillery spores on 50-100 cars in their parking lots. The next question asked is, "How do we remove the spots from the sides of cars?" We do not know, but some readers' suggestions have included: power washing if the artillery fungus spots are very new and paint/wax on the cars is also new and shiny; automotive-paint rubbing compounds; and removal (if there are only a few spots) with the edge of a credit card. However, you must be very careful not to damage the car's finish. See some car owners' attempts at removing the spots from cars at the end of this section. These are NOT our recommendations!!! Q5: I cannot see artillery fungus in the mulch – just how big is it? Is it the same as those little cups called the "bird's nest fungus?" A: The artillery fungus is quite small – the fruiting bodies are about 1/10 of an inch across and are very hard to see in the mulch. Artillery fungi are much smaller than the with which it may be mistaken. By the way, the bird's nest fungus does not actively shoot its spores – those little "eggs" of the bird's nest fungus are splashed out by raindrops, and thus are called "splash cups." Q6: Why is it called the "artillery" fungus? Is it also called the "shotgun fungus?" A: The term artillery refers to the fact that the artillery fungus actively (uses energy) shoots its spore masses, sort of like a cannon or howitzer (an artillery piece). We will call these "spores," although they are technically spore masses, or gleba. The spores are usually shot only a short distance but the wind can carry them for longer distances and even up to the second story of a house. The term "shotgun fungus" usually refers to Pilobolus (See The You Tube Video Link), a different kind of fungus that commonly grows on fresh horse dung. Q8: The artillery fungus problem seems to be much more severe now, than in the good old days. I don't remember this being a problem 20 - 25 years ago. Why is it now a problem? In addition, it is my experience that the artillery fungus seems to prefer wood as opposed to bark. Much of the mulch that we use today is recycled wood – in the past, most mulch was bark. In addition, the finely-shredded mulches used today also hold more moisture than the older coarsely ground mulches – this favors fungi, because they need moisture to survive and sporulate. Beware of any cleansers that have claims that sound "too good to be true", with regards to removing the artillery fungus. It is likely that they are, in fact, too good to be true. At the end of this section I have listed some attempts that readers have used to attemp to remove artillery fungus. Q13: How did the artillery fungus get in my mulch? My neighbors do not have it -- only me! Why me! Or spore masses may already be present at a site on old mulch, previously infested plant leaves, rabbit or deer droppings, decaying leaves, and grass. These existing spores may immediately infest new applications of mulch. Remember nature "abhors a vacum." In some cases, the spores also may be transported for very short distances via wind from adjacent infested sources. Spores may also be brought to the site on infested nursery plants, by being stuck to the undersurface of leaves, if the nursery also had an artillery fungus problem. When the leaves fall off onto the mulch... here we go again! Click HERE (FULL TEXT IN PDF) for an article from the Journal of Environmental Horticulture entitled "Artillery Fungus Sporulation on 27 Different Mulches - A Field Study." A: Used mushroom compost, also known as "mushroom soil," "spent mushroom substrate (SMS)," and even "black gold" is a great product, if you live in an area where you can get it, especially for free. Mushroom compost has many beneficial aspects for gardeners, one which is that it supports micro-organisms that inhibit unwanted pest fungi. Mushroom compost is pasteurized before it is used to grow mushrooms, and then the used compost is pasteurized again when it leaves the mushroom house, so it should not contain weed seeds. Our research at Penn State has shown that blending used mushroom compost with a landscape mulch at about 40% by volume (add 4 buckets of mushroom compost to 6 buckets of landscape mulch) will greatly suppress artillery fungus sporulation. Used mushroom compost is very "green" and environmentally friendly. Click HERE (FULL TEXT IN PDF) for an article from the Journal of Environmental Horticulture entitled "Use of Mushroom Compost to Suppress Artillery Fungus." A: Interestingly, homeowners that put down a new layer of mulch each year generally have less artillery fungus problems. But, we have not confirmed this practice. But it does seem to work slightly, if you don't miss a year! Q21: What if I just paint over the spores on my wood siding? A: There are no fungicides legally registered (labeled) for use against the artillery fungus in landscape mulch. Bleach, if it worked, would be very temporary, since it leaches out with each rain. We have tested many different fungicides in the laboratory, but have to take the experiments to the field. Q23: I cannot get those black spores off my siding, without leaving a lot of small brown stains. My siding is ruined. Will my homeowner's insurance pay for residing my house? A: Some insurance companies will and others won't. It depends on your insurance company, your agent, the exemptions in your policy, and especially your lawyer. Q24: I just checked my policy. My homeowner's policy states that it does not cover (that is, there is an exemption) "molds." Is the artillery fungus a mold? A: This is another difficult question, and one that lawyers like to argue. Mold is generally thought of as being a superficial, fuzzy fungus growing on damp or decaying organic matter. Like that fuzzy stuff on old "moldy" bread, on an old orange, or an old strawberry. The artillery fungus does exhibit such growth during part of its life cycle, when living in damp mulch, and therefore is (at least at times) a "mold" during part of its life cycle. A: Biologically, the term "mold" has been used to generally describe a wide variety of different organisms such as slime molds, sooty mold, pink mold, blue mold in cheese, water molds, etc. These terms may be found in most modern, scientific textbooks or dictionaries dealing with "Mycology" (the study of fungi). This general biological usage makes the term mold very inclusive; under such a general usage, therefore, molds include many types of organisms, such as the artillery fungus, at least during part of their life cycle. A: The spores on the side of your house are the reproductive structures of the fungus (although not biologically correct, think "seeds"). A good analogy is that they are shot like bullets from a gun. Just as the "bullets" are not the same as the "gun," the "spore masses" on your house are not the same as a "mold." Lawyers can put whatever spin they want on such terminology. And they do. A: Since the artillery fungus can enter the chain of events at various places, I don't see how anyone can be held responsible, unless they willingly supplied mulch with known artillery fungus in it. Which, of course, no good businessman would do! In my opinion, it is nearly impossible to prove where the artillery fungus entered the chain of events. This again is a subject for the lawyers. Q30: But, I don't like stone - it's so cold! I want to stay organic, and, like, use, like some sort of wood/bark mulch. Yet I can't stand the artillery fungus. It's driving me bonkers! What should I do? I'm at my wit's end! A: Well, then, you may have to learn to live with the problem. That is, you cannot beat the artillery fungus (at this time), so try to manage it. Use mulches that the artillery fungus doesn't like, such as large pine bark nuggets. Then, put down a fresh layer of mulch each year-- we have no evidence for this, but yearly applications of layers of mulch appear to inhibit the artillery fungus. A: The best thing to do is probably bag it in a biodegradable bag and take it to a landfill. At least the mulch is organic and will rot away. Make sure you don't put the infested mulch somewhere where you could be held responsible for someone else's artillery fungus problem. This is out of my field, but it has been suggested that the infested mulch could be put in a yard waste-composting facility. But you really need to ask this question to a "compost expert." * Note that most involve abrasives, and a lot of "elbow grease", especially if the spots have been on the surface for some time! So, one is really just scraping off the spots, which may land back in the mulch.... Having said that, please let me know if any of these actually do work! Again, these are not my recommendations. Corn oil will work to loosen the spores from car finishes. It can be applied using a soft nylon pad, like the "Dobie" Brand (but avoid such pads that will scratch the surface, e.g., Scrunge Pad). Wash it off immediately with soap and hose water after removing the spores. It takes a bit of rubbing, but it will loosen. Do not apply in direct sun as the oil will cook to the surface, especially on hot summer days. Remove the corn oil immediately lest it cake to the car finish. By no means, let it sit overnight. Polish the car thereafter to restore an even finish and remove any residual oil. The spots are on our cars. My husband spent over 2 hours this past weekend picking the spots off of my car. What a mess!! I have it and my daughter's car was covered in it. I took it to a local detail shop and they used white vinegar to remove it from the car. Car wax worked in the removal from my car (safely) with a little elbow grease. On my new truck, I used 'Turtle Wax Spray Bug & Tar and Tree Sap Remover.' I sprayed it on the spots (in small sections) and let it soak in for a few seconds. I then rubbed the spots with pieces of an old soft towel, occasionally using my finger nail thru the towel. In about 4 hours I got all of the spots off, probably because the spots were 2 days old or less. ... I found the following product to work the best in the area of removing the stain left on a vehicle surface once the sticky portion has been removed: Meguiars-Smooth Surface Clay Kit ... the entire vehicle will need to be done to ensure an even appearance otherwise you'll end up with glossy spots in the treated areas. To remove from cars or travel trailers. I have had great success by first scraping them very carefully with a plastic scraper and then simply removing the stain with "Magic Eraser." I happen to detail cars and have found these little spots, that I now know to be fungus (thank you) to be rather annoying. I use my thumb nail to remove the majority of the spores. A little residue is left behind which comes off easily with wax, once you break the hard outer shell. A Mr. Clean Magic Eraser will also work if you are not waxing the car, after you scrape off the outer shell. Just be careful, as Magic Erasers can damage paint if rubbed too much. If these spores are not removed quickly, they become rock hard and will be very difficult to remove. Dr. Davis, I would not suggest using a magic eraser on a car surface. I just got finished doing this and it left scratch marks which then had to be fixed with a scratch remover and then waxed. Today we successfully removed a bad case of artillery fungus from my daughter's car using an acid wash solution in a high-pressure sprayer. The work was done at my Dodge dealership, and the car looks incredibly clean again. No harm was done to the car's finish; the dealership uses the high-pressure acid wash on most of the new cars when they arrive. We will have to put a new coat of wax on the car as the acid wash removes most or all of the existing wax. First, I've discovered a product that seems to do a fairly good job of removing the spores. It still takes elbow grease, but one doesn't have to use credit cards and such. The name is Murphy's Oil Soap. I know, its hard to believe. I discovered this quite by accident, when after using it to clean my car's vinyl dash, and by chance tried it on pine sap stains on the exterior. The Oil Soap worked as well as bug & tar remover. When my girlfriend's white vehicle became covered with spores, I tried the Oil Soap and was able to remove all of the black spots with two applications. Thanks. I found that car clay might work a little better than Magic Eraser, although nothing seems to help the stains that have been there for a long time. I found that an automobile paint enamel reducer gets off even the most dried on spots. Do a test spot first as always. After a good rainstorm the artillery fungus rehydrates on my car and I simply spray with a garden hose or go for a ride while it's raining and the majority of the fungus comes off. If your readers would just be patient and just let their car soak in water by applying a very wet towel over the area and let the fungus rehydrate the fungus will come off easily with a rag. That's always worked for me in the past and I have a black convertible rag top (Mazda Miata w/ gray silver color that gets covered all over with the artillery fungus)!!! Today we successfully removed a bad case of artillery fungus from my daughter's car using an acid wash solution in a high-pressure sprayer. The work was done at a car dealership, and the car looks incredibly clean again. No harm was done to the car's finish; the dealership uses the high-pressure acid wash on most of the new cars when they arrive. We will have to put a new coat of wax on the car as the acid wash removes most or all of the existing wax. We found your web site very informative, and we thank you for your help. Artillery fungus has been an ongoing problem and finding an appropriate removal technique from my vehicle has been a challenge. However, the best technique I've used has been to apply a small amount of lacquer thinner to a rag and gently rub each spot. Be careful and just rub the spot. The thinner will soften the fungus and wipes right off. It is important to immediately wash and wax your car after completing this procedure. I recommend Macguire's multi-step waxing treatment. My white car somehow (no mulch anywhere in my yard or my neighbors') became covered with artillery mold last summer. I did not know at the time that's what it was. I power washed my car to no avail. Every time anyone touched my car they would get black smears on their hands. Last week I discovered entirely by accident how to remove it very readily. I was cleaning my windows and some over spray went on the paint. When I wiped, off the black dots went! Plain old Windex. I ended up going over my entire car one panel at a time with Windex and paper towels. No scrubbing. Just spray on, wait a couple seconds, and wash off. Even after it had been on there for a year! A run through the car wash to restore any lost wax and I was all set! Hope that helps people. Well, my Volvo was covered with easily a hundred spots. I didn't want to harm the gel coat by using detergent. Nor did I want to use scratch remover to take the underneath stain off after I chipped off the top layer. I took my electric steam cleaner out and focused a concentrated stream of steam on each dot. The high-pressure moist steam softened the spore and it came off easily using a cloth wrapped around my finger nail. It took about 2 hours to do the whole station wagon and there was no damage to the gel coat. It looks as good as new! My light blue shiny clean car (painted one year ago) was covered front to back with the fungus. I took it to a dealership body shop at the request of my insurance company. They washed, used a rubbing compound on the hard stain, buffed and waxed to remove all signs of fungus. They told me to keep it waxed with a good coat of wax. Not the thin liquid wax, but a thicker body shop type wax. My light blue shiny clean car (painted one year ago) was covered front to back with the fungus. I took to a dealership body shop at the request of my insurance company. They washed, compounded the hard stain, buffed and waxed to remove all signs of fungus. They told me to keep it waxed with a good coat of wax. Not the thin liquid wax, but a thicker body shop type wax. Not sure if you are still taking submissions for your blog, but this technique worked so easily for me on stubborn black spots that stayed put through car washes for nearly a year! It was raining on an off for several days. Research suggested that would make the cleaning easier. In a break for an hour or two, I put about a tablespoon of diatomaceous earth (food grade) into about 200mls water. I dipped paper towels in the liquid and gently rubbed back and forth a few times. Spots came off in a few seconds. Make sure that you rise and wipe the car thoroughly with water afterwards because if the earth dries on your car, it will look streaky and muddy. Simply sloshing and gently (but thoroughly) cleaning with water and a sponge after removing the spots left my car shiny and spore-free. Cheap, natural, easy and effective. Had to share it. We have recently had our home, garage door and vehicles attacked by Artillery Fungus. You mentioned methods for removal; I have found only one, and it works masterfully. However, the longer the fungus remains in place, the harder it is to remove. After approx. 2 weeks, I found our problems and consulted a local body shop. They recommended what became the ONLY to remove these dastardly creatures with zero negative impact to the finish of the auto. Siding is another matter…power washing may help. I have stucco and am requesting that my Association deal with the house exterior. A clay bar and detailing spray is the only way to go. It is work, but my two year old Rav 4 hasn’t been this clean since it rolled off the line. Applied warm water from a garden hose. Scraped the black balls off with plastic putty knife or my favorite was a Home Depot Gift card. Finished removing the black ball stain with a Mr. Clean Magic eraser (first do a small area, check for paint finish damage). Had an estimated 100 plus spots per square foot. A high pressure sprayer, bristle brush, plastic pot scrubber, and strong (vinyl safe) cleaners had no effect on the spots. A sharpened bamboo chop stick was the best tool we found for removing the spots. A sponge and detergent would then clean off the rest. The last thing we had done was to paint over the spores that were on the aluminum trim using oil-based paint and to have a few screens re-screened. Couldn't be removed with a brush and if picked off with a fingernail left a brown stain); called a power washing company, described the situation and they told her it was Artillery Fungus and they wouldn't even take our money because it was virtually impossible to get off. I have started using an ink eraser on the spots. It does leave a smudge, but takes out the stain completely. I am going to try car wax to even out the smudges. Labor intensive. I used a sponge with Simple Green on it (full strength is good) and on the other hand you take an INK eraser and you erase it, adding some Simple Green every few strokes. It removes it completely, then you buff the siding hard to remove any eraser smudges. Only way that I have defeated the fungus is to wash the walls with "outside clorox" along with a brillo pad. It is not a sure cure. Had one product that has recently helped me in cleaning off the spots left by the artillery fungus. It's called 'Pro-Tek Chemical' and when mixed in about a 10-1 solution of water ( and while using some small bristled type pad and elbow grease) I have been able to remove much of the worst of it. While I have just started using it, I cannot say what (if any) long term negative outcomes might be on my white siding. Within a week or two after landing, the spores may be emulsified with soapy water or removed with mineral spirits. I have heard that a product called Jomax and bleach may work. I've tried to get the spots off the surfaces and they don't really budge. I am able to remove the "spots" on the windows with a drywall putty knife and some soapy water. We have casement windows, so the fungus that is on the "white" vinyl casement around the window is the worse. Our siding is a wood grain tan color, so it does not show as bad. We suggest applying this solution with a soft bristled brush and removing with water. Beforehand we tried to remove the black spots with a power washer but to no avail. A year passed by and the condition grew worse. I tried steel-wool, but that really didn't do much. My wife tried a green Brillo pad and water. That had some noticeable affect but seemed to take a lot of scrubbing. Then, I tried Mr. Clean Magic Eraser out on the siding and with very little effort the spots came right off. I tried it on all three sides of the house and it removed every bit of it from the areas I applied the pad. Our vinyl siding has texturing to it, and so it was surprising to see how easy the spots were taken off with the Mr. Clean product. So ecstatic was I that I kept wiping away the spots within arms reach until the pad was depleted. Each spring I take a plastic scraper and remove all the spots I can find, then wash the siding with Clorox Cleanup. It's time consuming and a pain staking process, but I manage to remove 98-99% of the spots, with a thin outer circle usually remaining. When my husband noticed it I went to action right away- the Mr. Clean sponges work really well and I have been able to get the majority of it off of our bay window, screens and door. Of course this is only feasible because it is not as severe as in the past and the rest of the house is brick, but thought you might want to pass this along. It removes the entire spot and doesn't scratch. I have two gardens in the front of the house off the foundation. One side has pure peat moss and the other a wood/bark mulch. Surprisingly, the siding on the peat side has no spotting on the siding! This may be a solution to the problem. Possibly peat inhibits fungus growth.The only downside is cost. From DDDavis: "This is interesting, since many mosses including peat moss specifically are often anti-microbial, even being used in the old days for wound dressings in wartime!" We are having some success with one home with vinyl siding... have been soaking with cleaning solution called power house butyl degreaser and hand brushing, then rinsing. Although there is still a light stain [approx. 75% of the stain is gone], it seems to fade as it dries. We just got vinyl siding on our home...Alcoa's latest. I noticed the black dots this spring but wasn't surprised as my neighbors have been fighting them on their white vinyl pool fence for years. "Eagle 1 all around [automobile] wheel cleaner" took the dots off of the house siding fairly quickly...with my wheel brush...the cleaner is listed for painted or clear coated wheels. There doesn't seem to be any etching. The dot's have only been there since this spring...We've also used the magic eraser sponges from QVC on the neighbors pool fence but it takes some elbow grease. Live in new condo area. Artillery fungus a very big problem. Believe it or not, used Simple Green, a spray cleaner used for cleaning cars and tools. Tried it on siding. Takes off dark residue and doesn't leave stain. Seems to have no effect on siding. Just a quick note of thanks for your page on this blight to mankind that has cost me many hours of scrubbing of my cars and siding. Of particular usefulness was the link describing the experiments of the 10th grader in Virginia. Don't know if curiosity got the better of you and you actually tried her recommendations, but if not I can say the kid knows what she's talking about! Following the 2-step process, the spots literally wipe right off. My fingertips and nails are saved! There are hundreds of articles on-line saying you can't get the spots off. But, The kids method works! We did refine it a little by replacing the toothpaste with the Mr. Clean Magic eraser. It's a breeze. We wet a paper towel with mouthwash, wiped down the spots until they softened and wiped off (6-7 swipes did it) and went over the stain with the Magic eraser. The spots were completely gone. The only solution that I have found to remove the fungus is Soft Scrub cleaner with bleach.....and lots of elbow grease! The fungus attaches to our windows, front door, siding along the farmer's front porch and the porch rockers. I think we will resort to stone, peat mulch, or pachysandra next year as it takes days to scrape off the fungus each year. I am going to try the Scope and toothpaste idea this year. Will let you know how it works. Thank goodness we park our cars inside......I never thought of it attacking vehicles. I have removed all of the infested mulch already, and I am looking forward to putting something down that will not be prone to growth of the artillery fungus. My current plan is to remove the mulch and replace it with small rocks. The time consuming job is to remove the dots. I tried the mouthwash and Mr. Clean Magic Eraser technique and that does work. After looking at the blight on my aluminum siding for years, I decided to do a little research on the internet and stumbled across your web site FAQs on Artillery Fungus. I've tried many cleaners, but it mostly came down to a lot of elbow grease. Tonight I decided to try a Mr. Clean Magic Eraser. I was so excited that I called my wife and kids out to take a look at how easily it removed the spores and stains. Within a matter of minutes I had the front of my house clean. If we can't get rid of it, we may as well learn to live with it. This certainly makes it manageable. Thanks for the article regarding artillery fungus and how to remove the spores from vinyl siding. My husband and I tried everything in the house to try and remove the spores. We found by accident that if you sprayed the area with Easy Off oven cleanser and let it set for 5 to 10 minutes, it came off a lot easier. The oven cleaner acted like it would normally in an oven. I did first scrape off the spore with either my fingernail or a plastic scraper. Then I applied the oven cleaner. Let it set on the spores for a few minutes, then using the Mr. Clean Magic eraser was able to remove most of the spore. It did leave a small red dot, but it is faint, and we are hoping the sun will eventually fade he red stain over time. Hope this will help others. (I tried) bleach, stripper, M1, acetone, mineral spirits, gasoline, a prespray of fungicide and nothing worked. What I did find upon alot of research and finding your site was MAGIC ERASER! I presprayed my siding the evening before with a mixture of clorox bleach and M1 mildew aide and let it sit until mornin... The next morning I started scrubbing with a tad bit of water and Magic Eraser and amazingly almost every stain came off. I did find that the earlier you do this the better! This fungus had went approximately 12-15 feet up from the ground. Now, my siding is fairly spotless again and I hope that this information will help assist people so that they will not buy chemicals that do not work! MAGIC ERASER AND ELBOW GREASE AS SOON AS POSSIBLE! The abstract by the 10th grade student in Virginia identified Cinnamon Ice Scope mouthwash. I could not find this in my local stores, but we had some Walgreen's Spring Mint antiseptic mouthwash. It worked well, after allowing it to penetrate for about 5-10 minutes. Using a heavy-duty Mr. Clean Magic Eraser and mild rubbing for 15 - 20 seconds removed the stain effectively. Your background, FAQ and readers' suggestions have been helpful. We live in CT, have used a pine mulch for years but this is the first year we noticed the fungus, probably just missed it in the past. We tried most of the suggested solutions without success. Today we tried a product called ECO ORANGE, produced by PRO-TEK Chemicals. A 10:1 ratio removed most of the spots with limited scrubbing. We are just experimenting with it in small secluded areas and giving it a few days to see if there are any after effects. Thanks for your research and recommendations. No one in our area [eastern Illinois] ever heard of this fungus. Landscapers, lawn service, cleaning services, insurance provider, let me rephrase that, insurance non-provider, knew what the black dots were. Yes we removed all the mulch. We had a 15x25 flower garden area at our entrance, on the North side of our home. We tried to burn it and what was left we buried. We had obtained the mulch from a wood palate company in a town north of us. It was not treated, and we thought that was why the fungus grew. We have scraped the soil after removing the infested mulch, sprayed with a fungicide, for extra measure, lay down a plastic barrier, and purchased treated cypress mulch. There are still many many spores on the surrounding plants that make me very nervous.... I was successful in removing the spores off the six large windows across the front of our home. A large razor blade in a handle was convenient. I learned quickly not to scrape in a vertical motion. All the spores popped off all over my hair, face and down my t-shirt. Yuck!! Thanks again. I hope we can help others in their plight. I read all your posts on removal and I have to say I didn't have much trouble at all removing the specs from my vinyl siding. I mixed mouth wash with bleach roughly 2:1 and wiped the spots down then went back about 15 minutes later with the same mixture and a magic eraser. I, too, just tried the Mr. Clean Magic Eraser to clean artillery fungus spots from my windows, window frames, and door frames, and it worked great. Like magic! Took a little elbow grease, but not much. I think it works better if you wipe over the spots with the Eraser and let the wet solution start working for about 15 seconds before trying to remove them. It appears to reduce the amount of pressure required when scrubbing them off. Not sure what I can do, yet, about the spots on the stained cedar, though. Mr. Clean doesn't work on that. Incidentally, I have been able to remove the periodiles from my siding using either Simple Green or an antiseptic mouthwash, followed by some hard rubbing with Extra Strength Mr. Clean Magic Eraser. I had thousands of black spots on my James Hardee Siding and Anderson Windows. After trying many techniques, here is what worked best for me. Take a new paint stir stick. Cut a piece approximately 4" to 5" long. Using a pair of pliers, break the piece in half (long ways). Round the corners slightly by scraping the stir stick corners on dry concrete. Get a bucket of warm water. Drop the stick in the water to get it wet. Use warm water, and a two sided sponge (one side is abrasive). Rub the abrasive side across the black dots until the tops scraped off. Don't have to grind. Rewet area with the soft side of the sponge and let soak for several minutes. Continue working other spots. Then after several minutes of letting a spot soak...use the wetted stick to rub off the remainder of the black spot. Periodically, re-wet the stick. Works amazingly well and does not scratch the painted surfaces. Very effective getting off spots in the siding grooves. Also gets residue brown stains off of metal window frames and gutters. Just a note to let you know that undiluted hydrogen peroxide completely dissolved (quickly) the artillery fungus spores on my lanai [terrace]. Just poured it onto the concrete, covered the entire area with a using a scrub brush (no scrubbing) , wait a few minutes and VERY EASILY removed with gentle brushing then rinse! Very Happy now! Tried EVERYTHING else. Here is something that worked for me and is only $10.00 per gallon which makes 32 gallons after mixing with water. ODOBAN. it even states that it removes mold..... You do have to wet with the solution, then take a terry cloth (rough) and use some elbow grease and it goes away. I would recommend leaving a solution on the vinyl to prevent further spores. I was unable to do my gutters last year...and this year you can see that they look bad and the house still is clear of the mold/fungus. Thanks. That is what I was hoping. I found the ultimate tool for removing the spores. It is a dremel tool with a very narrow wire brush. The tools set to the lowest setting and using a very gentle touch it removes the spores. And often the stain without damage to the siding. A quick wipe with a magic eraser removes any remaining stains. May I suggest that you try a product called Wizards Power Clean. It is made by Wizmar Int. Inc..This product sells for about $10.00 for a 22 oz. spray bottle. It is environmentally safe and I guarantee that you will be pleased with the results. It will remove the fungus by simply spraying it on the surface, letting it stand for about 7 to 10 minutes and rinsing it off with a pressure washer. Not only will it clean the fungus, it is good on bugs, white walls, rims and pretty much anything you want to clean easily. I know, I sound like a salesman for the company but I assure you I am not. I have however spent 30 years in Law Enforcement and 18 months in Southern Afghanistan and I know what it takes to replace siding on a home. So, tell you readers not to cry but to try the product. I live in southwest Florida and noticed these 'blood spots' on my lanai [terrace] and after some research on the net figured I had an artillery fungus somewhere in the lanai [terrace]. Tried several types of chemicals then sat down and thought about it. I'm a nurse and hydrogen peroxide works wonders getting blood (an organic compound) out of my uniforms so I tried it. IT WORKS!!!!!!! Full strength (it's a cheap buy) and after it bubbles and kills the spores they just brush off with a wet brush! Please post if you can, didn't see this solution on your site. I had a pretty severe case of the artillery fungus on my vinyl siding, so I mixed up a solution of 4 parts Clorox Bleach with 1 part water, and added a dash of dish washing detergent. Then I took a soft bristle brush and attempted to remove the fungus from my siding with this solution. To my surprise, the fungus came off quite easily with very little elbow grease. The fungus has been removed without any spotting or staining. I’m amazed, since my previous attempts to remove the fungus all failed. Just a quick update on how I am doing getting the artillery fungus spores off my home. Perhaps you could add to your FAQs for others to read. On my vinyl/plastic fence, I used a combination of water and Comet cleanser. I dipped a brillow pad into this and scrubbed and hosed off. The spores came off realtively easily. On my aluminum siding, I used TSP mixed with water after scraping. This was more laborious, but got the spores off. I was able to get the fungus off my windows using a paint scraper. I was able to get it off the window capping using by gently using a brillow pad. I got if off my plastic/vinyl fence using a brillow pad and TSP. My aluminum siding was another story. I cleaned it off as best I could, but ended up repainting it. I found that Krud Kutter works great. I have to scrape the tops off the adhered peridioles first by spraying the Krud Kutter, soaking for a minute and using good old fashioned elbow grease, but then soaking with Krud Kutter again for a minute and using a Mr. Clean Magic Eraser removes the spot as if it were never there. This is time consuming, but removes every trace. Mine have been there for two years prior to finding that this worked, and they are being completely removed. Please add this to your article for others. First I scrape the siding with a plastic putty knife. This gets rid of the "top" of the fungus spot. I then spray automotive "tar and bug remover" on the siding and let it soak for several minutes. Next I take a Mr. Clean Magic Eraser (extra power) to the remaining stain. It comes off fairly easy although it still takes some scrubbing. The results are pretty good. I have a house on Cape Cod. Two years ago I noticed that my white vinyl fence had these stubborn black dots that did not come off when I power washed the fence. I tried scrubbing with soap and water, used a TSP cleaner, nothing worked. I read your web page and decided to use the mouthwash/magic eraser on the spots. My wife found the spots cleaned easily with this method, so she used the magic eraser alone and that worked just as well. This morning I sprayed Fantastic brand spray cleaner and used a Scotch Bright No Scratch Heavy Duty kitchen sponge (using the green scrubber side of the sponge) on the spots and they simply wiped away without any scrubbing effort. I've been trying many of the remedies with no real luck. Hydrogen peroxide did not work. Mr. Clean magic eraser works but very, very slowly, and with much elbow grease, too slow to remove all. I also tried automobile bug/tar remover - no good, pure kerosene did not work. I will try the mouthwash and toothpaste or extra strength Mr. Clean magic eraser next. The spores on the glass bay window was very easy to remove with a one sided razor blade. Must keep window wet so that the brown residue won't stick. Comes out nice and clean. I tried everything listed on this page and to no avail. Nothing removed this horrible fungus. So I got out my small wagner steam cleaner and with a rotating brush on the hand held wand I steamed and scrubbed and amazingly they came completely clean, stains and all just like new siding put on my house. It took quite a few hours for a 6 x 12 ft area but did the trick. Never saw anything so difficult to remove, but worked like a charm. Have tried many tactics to rid our windows of the spores. Best one by far to-date has been Tilex Mold and Mildew spray. Works well on the glass - have not tried it on the wooden window frames yet. Saves a lot of elbow grease. Next I will try the Magic Eraser and mouthwash suggestion. Thanks a million for posting these for people like me who are faced with a big cleanup. Today I experimented and found that Shaklees Basic H (diluted) and Scour Off products, along with a Mr Clean eraser sponge does work. First I spray on the Basic H, then put the scour off on the Mr. Clean pad to do the windows. As for the siding, I did the same, except used a green Scotch scouring pad. Zep House and Siding Cleaner and a gas-powered pressure washer - DONE! No fungus - no stains. I have had great luck with Clorox Soft-Scrub and an old t-shirt. A damp shirt and a little Soft-Scrub, and a lot of elbow grease removes the spores without scratching the surface. I have used this on vinyl siding, aluminum fascia, and vinyl windows for several years. I have replaced my hardwood mulch every other year for the past 8 years, as it seems to take a couple of years for the fungus to get established. a) First, use a scraper or wire brush and scrape over a section of affected vinyl siding. b) Use paper towels with small amounts Automotive Preparation Solution (“Prep-Sol”) dispensed from a squeeze-top plastic water bottle. You have to rub this in hard, but it does remove the stain. I did have success with this process in removing the spots completely. I am unsure if this would work on painted wood, but I imagine it would remove latex paint. I hope this helps. Again thank you for the article. I wanted to share with you what I tried recently to combat the artillery mold on the front of my house [Fredericksburg, VA]. After reading all the suggestions submitted, I got the idea to try Dawn Power Dissolver on the mold spots. I sprayed the solution on and left it for about 15-20 minutes, then scrubbed the area with a wet Extra Strong Magic Eraser. Then I hosed down the area to wash off the residue left by the magic eraser. It worked remarkably well. The test area is totally free of mold spots. For artillery fungus on vinyl siding, use Mr. Clean magic eraser. Make sure it is wet, rub hard and wipe the residue off. This works but is very labor intensive. After trying everything under the sun and on your site the most effective remover is found in our kitchen; vinegar. Saturate fungus with a spray bottle containing vinegar, let fungus absorb vinegar for several minutes. Use wood putty spatula to remove fungus. Most times will remove all of the fungus substance. If brown spot is left magic easer will remove it easily. Spray on some water then spray oven cleaner and let it stand for about a minute or two then spray off with power washer . I have white vinyl siding and if it stains light brown then I spray on bleach. Using dawn on wood siding. Works the best for me. I had the same problem of Artillery Fungus all over my white vinyl fence. This is a five-foot, open picket vinyl fence and was literally covered in black dots (I could not even see the white in some areas). I used a product from The Home Depot called "Behr Premikum Deck, Fence and Siding Mildew Stain Remover". This is a biodegradable produce in a one gallon (3.79 L) light brown container. Using a scrub brush, and this product (full strength), I used a hose to wet the fence, then scrubbed the product on the fence and rinsed the fence section off with the hose. The black spots went away almost entirely without leaving brush marks. The fence now looks as good as the day it was installed. CAUTION: Areas around the fence (grass and/plantings) needed to be sprayed with water and covered with plastic before using the product. Without going into detail about my experience with this mold, I would like to simply relate to you a simple solution for MY problem. I simply got a brillo pad out to see if I could remove some of the mold with it. Lo and behold without too much scrubbing I was able to remove the mold with the brillo pad. My siding, which is vinyl, doesn't seem to have suffered any damage as a result. I'm fairly sure that on metal siding this would not be the case. I have read people's problems with this and tried a number of their suggested remedies without success. This seems to be a simple solution but it worked for me. Cleaned large portions of affected area in front of house then applied strong concentration of fertilome systemic fungicide to plants and mulch....after one month spores have not returned. I had Artillery Fungus on my vinyl siding and removed it very easily with Easy Off oven cleaner. Just sprayed it directly on the black spots .....let it sit for 5 minutes and wipe with a wet cloth. I used a green ScotchBrite pad and some Westley's Bleche-White Tire Cleaner. Still takes lots of elbow grease but it did remove most of the dots. The mouthwash/Magic Eraser worked well on the vinyl casings of my windows. The credit card method of removing the spores worked well although I have found nothing removes the stains from the wood siding. Your paper on artillery fungus was very interesting to me. I recently retired from the power wash industry where I worked for over 40 years. I thought I might add my 2 bits just for your information. In Wisconsin we did not have much occurrence of artillery fungus until after Hurricane Ivan hit the Gulf Coast in 2004. Huge quantities of downed cypress were processed into mulch and distributed here and other parts of the country. Once that material was spread in plant beds we began to see lots of spores on siding. It was so rare here that I virtually never saw it before that time, though I had been washing houses since 1984. The spores can be removed from brick, vinyl or steel siding using hot water under pressure with a spot or zero degree nozzle. Each spore packet must be attacked individually and can be time consuming. I have seen some homeowners remove them using popsicle sticks or chopsticks and elbow grease. There are some chemical treatments that can speed up the process but the siding must be able to tolerate strong alkaline materials that soften organic fibers but also can remove paint. Obviously not a choice for standard wood sided homes or painted surfaces. Many of my customers were able to avoid recurrence of the spores by treating the mulch once a month or so with a 6% solution of household bleach and water, applied to the mulch with a garden sprayer, avoiding any plantings. In general the spore distribution stopped where the mulch ended, except in those cases you mentioned where wind carries the packets farther away. I have not done any scientific testing to support my methods, just spent hundreds of hours removing the stuff. It can be done but is not a do it yourself undertaking without a tremendous amount of physical labor. My stuff: oil eater for vinyl with the magic eraser (scrape lump first); on wood siding dawn and water 1/2 and 1/2 after a plastic putty knife scraped off the lump again using the magic eraser. Oil eater softens latex so don't use it except on oil base paint. These removed all traces of mold. Soaking spots before using elbow grease made the removal easier. I enjoyed reading your research papers on Artillery Fungus. I have a battle on my hands with this fungus, it is all over the front of my house. I believe that we may have first noticed it about 4 to 5 years ago and did not realize what it was at the time. About a year ago someone had said that it was some kind of fungus, well last week I looked this up on the internet and was overwhelmed. I have tried a few of the suggestions that you have posted from readers of your research papers. I have found that by scraping them with a plastic putty knife and then using a Mr. Clean Magic Eraser Extra Power I am left with a small faint reddish spot which I am hoping will fade completely over time. This is a very time consuming process but needs to be done. The experts are right, there is NO easy solution to removing those black spots from your siding. Work on about a three square foot area at a time. Wet it down with a garden hose and keep it wet for about ten minutes. Next scrub the spots off with a soap filled SOS pad. Next rinse the area with the garden hose once again to remove the soap. It takes a little effort but the entire spot is removed including the brown residue. The suggestions to pre-treat with windex, mouthwash, WD40 or what have you all help but plain water from your hose does just as well.